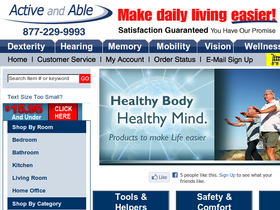 Visit Active and Able, online at ActiveandAble.com for products & supplies designed to make daily senior living easier and more comfortable. Active and Able carries products for bath safety, hygiene, bedroom, daily living, dressing, exercise, home health, memory, mobility, recreation, and more. Save on your next purchase from ActiveandAble.com with Active and Able discounts, Active and Able coupons and Active and Able savings from 58coupons.com. When you spend over $50 or more at ActiveAndAble.com you can enjoy Free Shipping with this coupon code. When you order $100 or more at ActiveAndAble.com you can get $10 off your order with this coupon code. Click link to shop at Active and Able. When make a purchase from ActiveandAble.com for the first time, get 10% off orders of $50 or more! Click link for this great offer. Get a 5% off coupon when you sign-up for the newsletter from ActiveandAble.com. Click link to learn more.